When: Tuesday, July 8, 2008 ? 7:30 p.m. The Friends of the University Minnesota Libraries and the Children’s Literature Research Collections proudly present a Twin Cities appearance by David Hajdu, author of The Ten-Cent Plague: The Great Comic Book Scare and How It Changed America. Dessert reception follows with books available for sale courtesy of Red Balloon Bookshop. David Hajdu will be signing books during the reception. Comic books, not rock-and-roll, created the generation gap. They also spawned juvenile delinquency, crime, sexual deviance, and things of unspeakable depravity. Long before Elvis appeared on Ed Sullivan from the waist up, long before Jerry Lee Lewis married his cousin, long before James Dean yelled, “You’re tearing me apart,” teachers, politicians, priests, and parents were lining up across from comic-book publishers, writers, artists, and children at bonfires and Senate hearings decrying the evil that was the ten-cent plague. 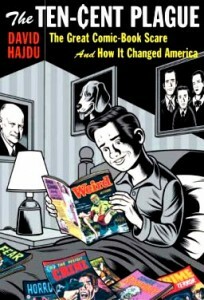 David Hajdu’s “The Ten-Cent Plague: The Great Comic Book Scare and How It Changed America” comprises the last book in an informal trilogy about American popular culture at mid-century, and radically revises common notions of popular culture, the generation gap, and the divide between “high” and “low” art. This special event with David Hajdu is part of an evening celebration honoring John Borger and his gift of almost 40,000 comic books to the Children’s Literature Research Collections at the University Libraries. They had me at “Dessert reception”.